Update 3/7/13: Lure Fish House Westlake Village opened TODAY at 4pm. Update 2/13/13: No specific date yet on opening date for Lure Westlake Village but they are advertising jobs on craigslist so it must not be far away. Update 11/18/12: Lure Fish House Ventura is opening to the public TOMORROW, Monday, November 19th through Nov 21 at 4pm, closed Thanksgiving Day, then back open regular hours of 11:30 am to 10 pm Sunday through Thursday and 11:30 am to 11:30 pm Friday-Saturday. Lure Ventura is located at 60 South California Street, between E. Santa Clara St and Main St. (next to Cafe Fiore). The restaurant can be reached at 805.567.4400. 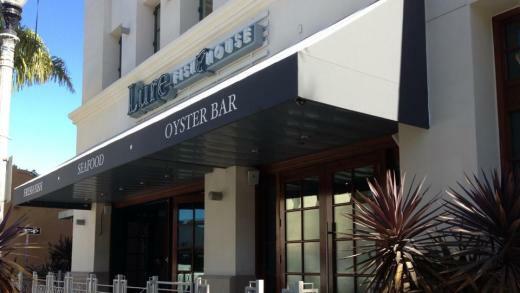 Lure Fish House Westlake Village will open sometime soon. Update 8/28/12: Lure Fish House is now hring for up to 200 positions for these new locations. Check the Ventura Craigslist ad at http://ventura.craigslist.org/fbh/3224744391.html or visit www.LureFishHouse.com. Original Post 6/27/12: My wife has been raving about the oyster bar at Lure Fish House in Camarillo. It has become a mainstay for her and her friends. And then she took me and the family there on Father's Day weekend. (More on our Lure experience here.) But what I didn't realize at the time was that Lure is in process of building out not one, but TWO new locations that they note on their Facebook Page! The Ventura location will be at 60 California Street in Ventura, in a new building just north of Cafe Fiore. Construction progress as of June 25 can be seen here. Last month they noted that they will be opening a new location at the former home of The Edge Grill, 30970 Russell Ranch Road, Westlake Village. The Edge closed its doors on April 6, 2012 and was formerly home to Fox Sports Grill. This game of musical restaurants may quickly come to a close once Lure graces its presence there! No word on the opening date of these locations...so stay tuned.